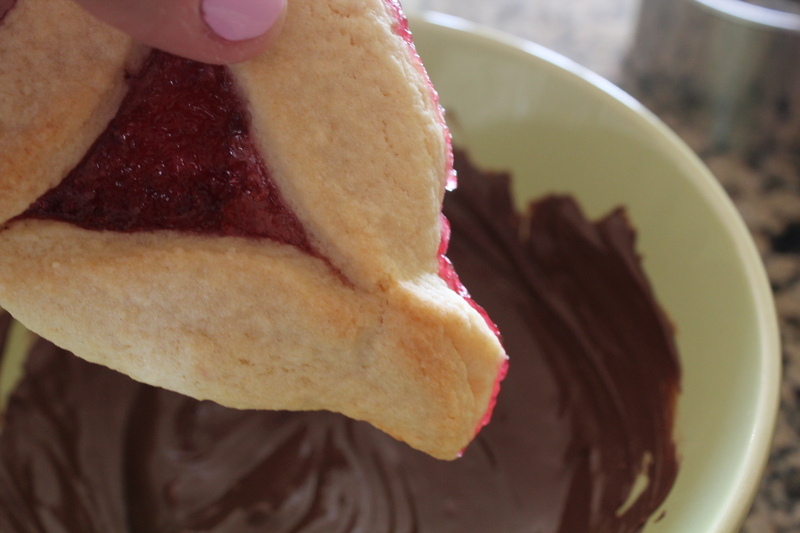 How to make the best hamantaschen, plus tips and tricks for you! 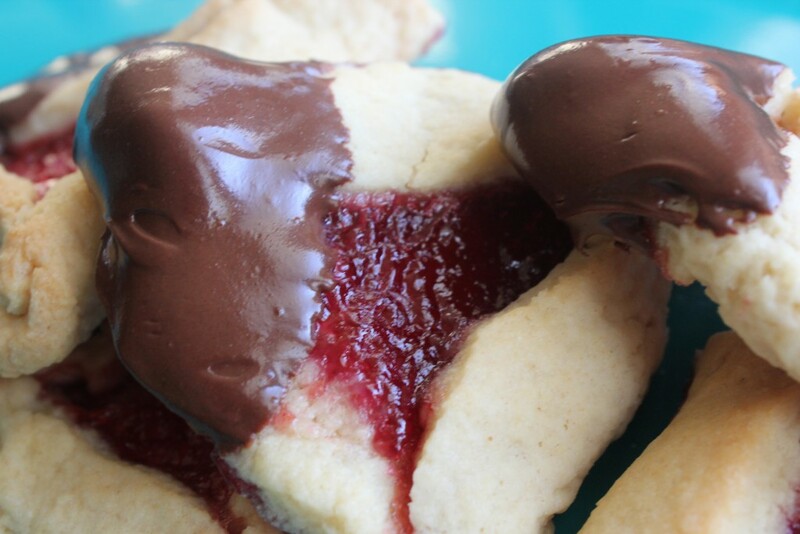 Check out more unique hamantaschen recipes here! Out of the literally dozens of Jewish holidays, Purim has always been my favorite. Why? Two words: Jewish Halloween. I am a HUGE fan of secular Halloween, so why celebrate only once a year? Okay, Purim isn’t exactly Halloween, but there are costumes. What’s my best costume you ask? Good question. It would have to be a three-way tie between Leonardo of Ninja Turtle fame, Blaze of the original American Gladiators and She-Ra (please tell me you know who She-Ra is so I don’t feel so old). And no I will not post photos- I keep those puppies safe on secure websites. Like Facebook. And don’t forget my bagel and lox costume! Anyhoo, if I had to sum up the majority of Jew holidays, it would go something like this. Someone tries to wipe us out, by some ridiculous miracle we triumph, despite lack in numbers and stature, so we rejoice by eating and drinking. And repeat. Purim is no different. Esther, a sassy young Jew living in Persia, saves all the Jews from the King’s evil adviser Haman’s devious plans of extermination. So we rejoice with tons of rowdy parties, costumes and hedonism. Hence why Purim is known as the Jewish Mardi Gras or Halloween. Sign me up! 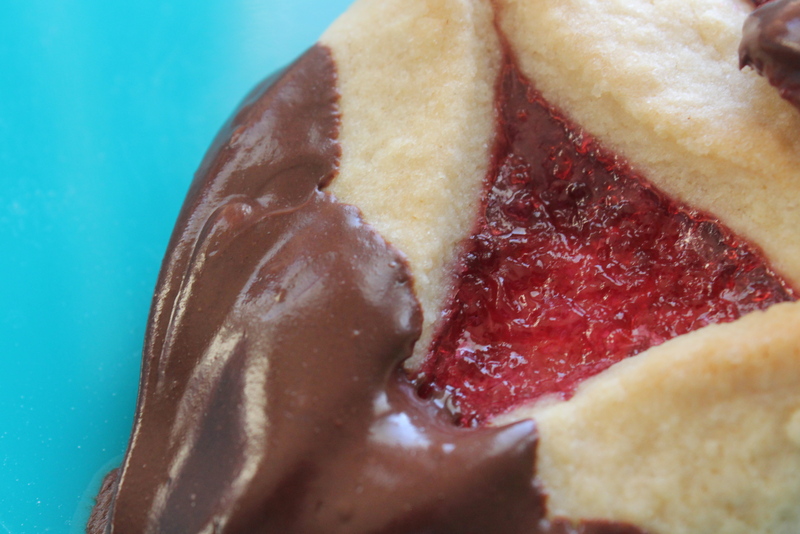 To celebrate, we make tasty triangular cookies called hamantaschen filled with goodness to represent the fashionable three-cornered hat Haman was known to sport. Poppy seeds and prunes are the most common fillings, but I got a little feisty and went with the priciest jam I could find at Whole Foods. And then I dipped them in chocolate. Just because I can. Here is all you need for your very own hamataschen. I used a fancy schmancy jam as my filling, but feel free to go wild with anything from peanut butter chips to coconut to nutella! First, combine all the dry ingredients. Next, add in your liquids and mix up with your (clean) hands! 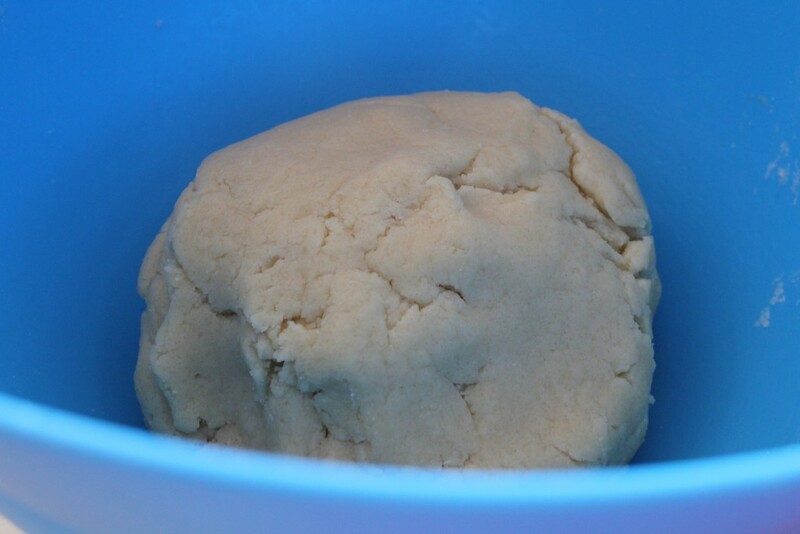 Roll your dough into a ball, and chill for 1-2 hours. Or overnight. 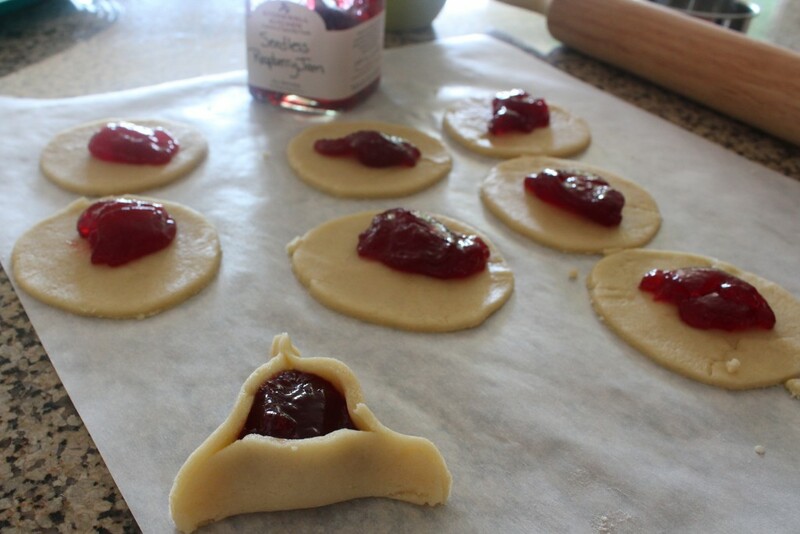 Then, roll out your dough and cut into rounds with a cookie cutter. A wine glass works just as well! Add filling of your choice, and pinch in three corners to make a triangle. You can overlap the sides to make a triangle too. And now, the tips to success. Freeze the hamantaschen for 20-30 minutes as you pre-heat your oven. 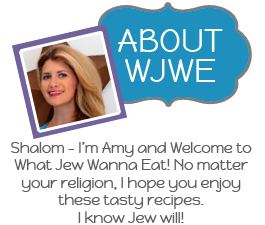 Use an egg wash for color and to help hold it together. The freezing also helps prevent them from spreading! Ta da! They taste fantastic! Especially when dipped in melted chocolate. Yum! Jam or filling of your choice. 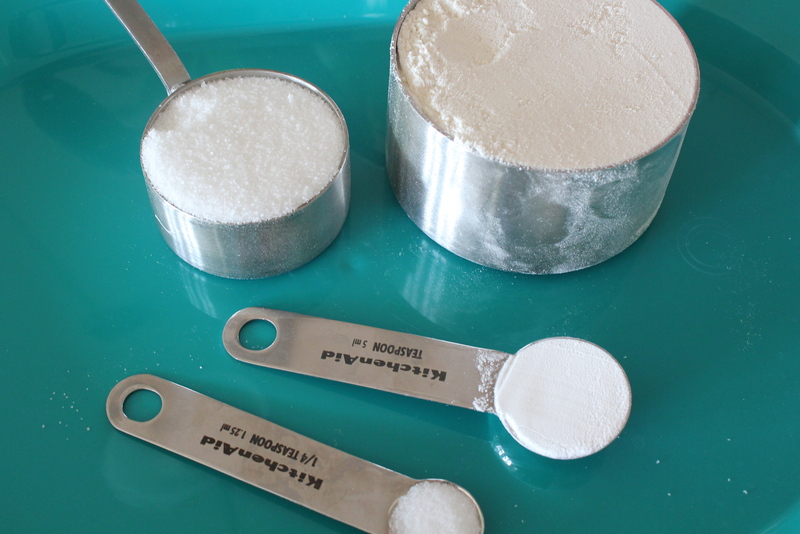 In a large bowl with a stand or hand mixer, blend butter and sugar until light and fluffy, about 2 minutes. 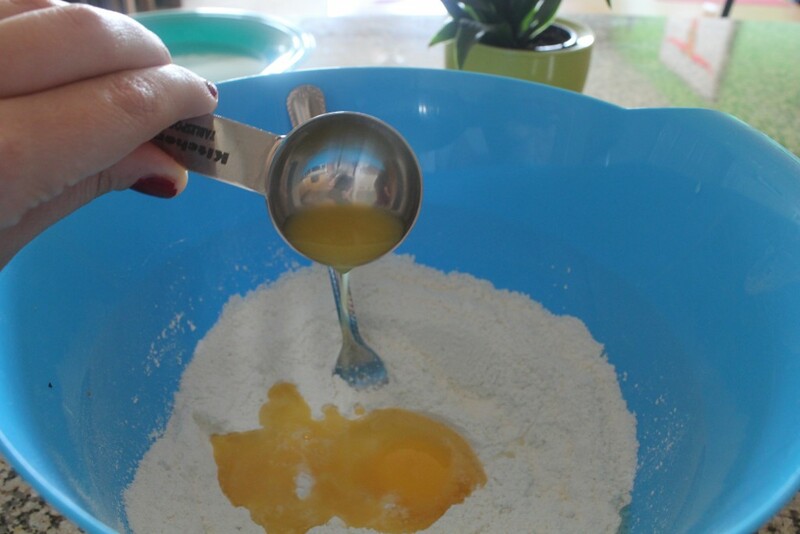 Then add vanilla, 1 egg and orange juice and combine. 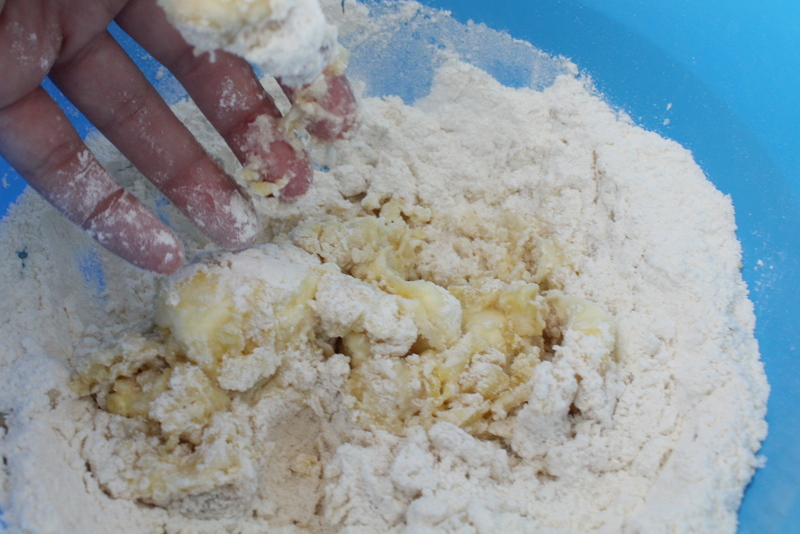 Then add flour, baking powder and salt and mix just until combined. Dough should be slightly sticky. Form dough into a large ball, cover with plastic wrap and chill overnight or at least 2 hours. 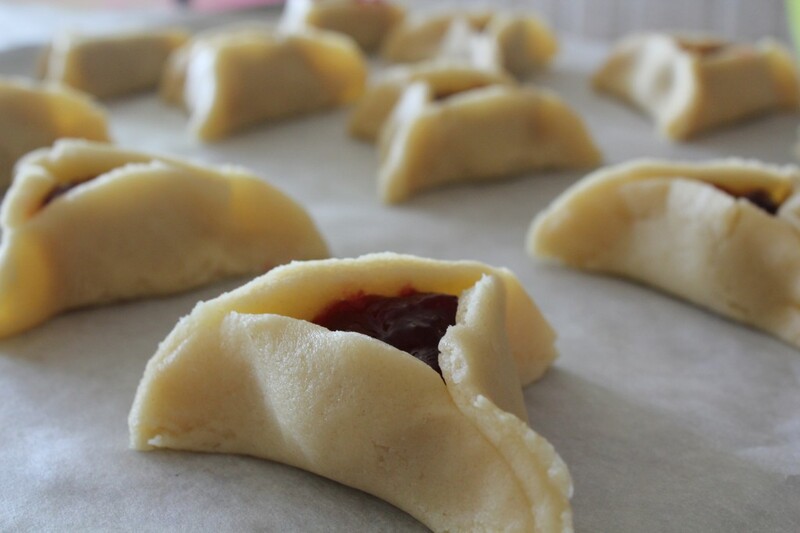 When you are ready to make your hamantaschen, preheat your oven to 350 degrees F and roll out the dough on a floured surface until it is ⅛ inch thick. 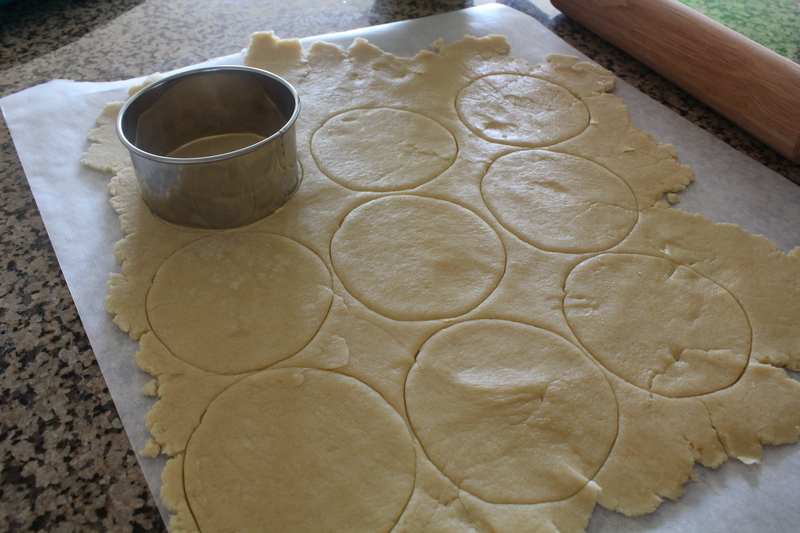 Use a 3 or 3½-inch circle cookie cutter to cut circles in the dough. The top of a wine glass works too! Roll out the scraps and recut into circles. 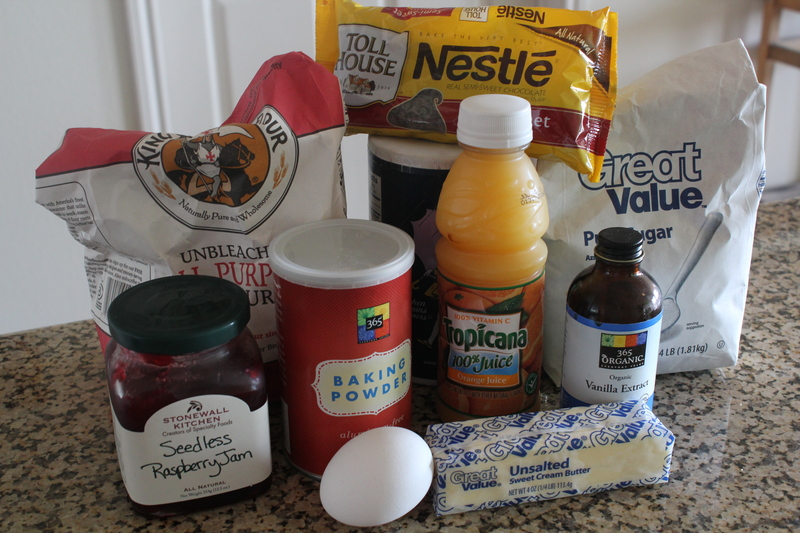 Then take a teaspoon of the jam and put it in the center of each circle. Don’t add any more- the filling will spread to fill the cookie, and any more would just run over the top making for ugly yet still delicious hamantaschen. Fold two sides together overlapping at the bottom, and then fold the top down to make a triangle. Place on a parchment lined cookie sheet and freeze for 30 minutes to prevent spreading. Wash with egg wash. Bake for 15 minutes or until lightly golden on the bottoms of cookies. Cool and enjoy! hmm… i think i recognize this recipe! love your twist on it with the chocolate-dippage. will def give that a try when i make my annual batch of hamentaschen next weekend. You caught me! Chocolate always makes everything better. Words of wisdom. oh yeah, i forgot to tell you – i also put an eggwash on them before baking, to make them all nice and shiny! Oh yeah I remembered that as soon as I put them in the oven. Oh well! Haman would “eat his hat” if he saw these delectable treats! Another great twist on a traditional Purim food. Oy oy what will you do to Matzah? Bubbe you read my mind! 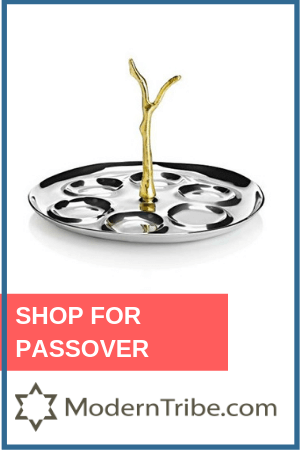 Passover treats are next! Thanks so much, Gloria! The chocolate really adds something special. And I love the contrast in colors! I would gladly do mail order!! I actually hope to send my Bubbe some cookies up in Connecticut so I will see how they travel. 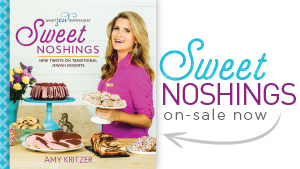 I just ate one, and Amy’s no liar – delish! 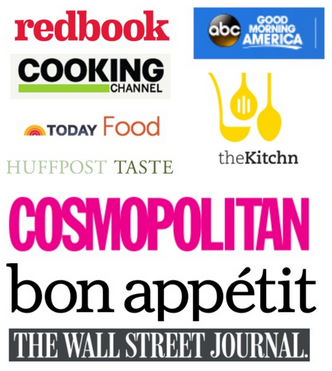 I adore you, your recipes and your hysterical “haman eating his his hat” Bubbe! 🙂 When are we mahjing? Haha thanks so much! I have visitors the next two weeks for SXSW, but will definitely be Mahjing after that! Love the chocolate idea. I always sprinkle powdered sugar on top of mine. I really love honey and trying to think of a good way too add honey in my recipe. Thanks! Powdered sugar sounds tasty too. Maybe you could make some sort of honey filling? Love to try this. My bubbie was a wonderful cook, but I disliked her Hamantaschen. She used prunes and poppy seeds. I love to bake and will try your twist. Happy Purim! This dough is cakier than most drier doughs which I don’t like either. Let me know how you like it! Amy, What happens if you don’t chill the recipe overnight or for a few hours? 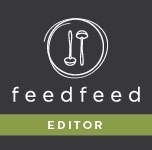 I’m looking for a recipe that doesn’t need chilling. Hi Yael, this recipe is best with chilling since the dough is sticky. You could try freezing it for less time but I haven’t tried that.